Finding quality age-appropriate content can be tough—not because it’s not out there on the Web, but because there’s so much kids streaming video content to sift through. The last thing you want to do is hand over your iPhone/iPad to your preschooler to surf YouTube alone. Even searching on seemingly benign terms like Dora and Diego could bring up some less than kid-friendly results. One free solution to this dilemma is Playrific, a company that has taken everything from educational videos to kid-friendly movie trailers and aggregated them into a single “advertising-free” platform. Kids can watch great content and parents can breathe a little easier, knowing that what is being viewed is appropriate. 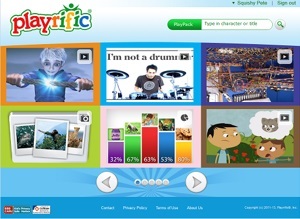 All video, pictures and books are screened by Playrific's panel of educators and experts before before content posted. Once live, the videos cleanly appear in one screen (called the “Playground”) with six tiles of video that you can select from. The thing that really separates Playrific from other kids’ content providers is the service's ability to learn what your child likes to view and customize your child’s content along the way. This is based on the content your child consumes and quick pop-up quizzes. The more your child uses Playrific, the more it learns—pretty cool. You and your child will need to be patient as it learns, though, as there’s currently no way to set up an initial profile to help it “learn” a little faster. Playrific is free to download for both the iOS and Android platforms and you can download the Playrific Console to your computer. The apps need some work (like adding search capability, as exists on the web version), but Playrific experience on the Web is great.